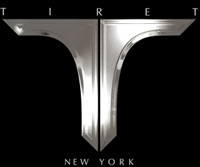 Tiret is a New-York company, it was founded in 2004 by a talented designer Daniel Lazar. For many years it was producing jewellery accessorizes and watches. Tiret watch for a short time has taken their deserved place at a trade having seduced lots and lots of people by incomparable design and perfect appearance. Rare and high-quality materials, luxury colors of gems which make an outstanding shine ans Swiss movements as well. Tiret watch are presented by elegant and posh models, which became an implementation of boundless design ideas and innovation technologies. Tiret watch are chosen by people who follow the latest trends and who want to accentuate their individuality and a perfect style. Luxury watch are decorated with gems and semiprecious stones and made in a classic style. There is no sport watch or waterproof watch in Tiret collections. Tiret watches are elegant, they are presented by a wonderful blend of of high-quality materials and colorful gems which shine on the wrists of their owners anytime. Today jewellery and watch made by Tiret Fashion House can be bought in many boutiques all around the world. Lots of celebrities and movie stars wear Tiret Watch. The main idea is unique production issuing. A lot of experienced watchmakers work at original production issuing combining all their skillfulness at a small masterpiece. For a high quality of the production providing Tiret brand buys materials and gems at the leading distributors. Tiret collaborates with IGC Group and buys their diamonds Exire® which characterized by a modern technology of diamonds processing and polishing. Incomparable Tiret models are presented in the following collections: Gotham auto chrono, Gotham power reserve, Moments, Second chance, Automatic chrono, Debonair, Tourbillon, Exclusive Design. In Gotham auto chrono and Gotham power reserve ordinary watches and chronographs in squared cases, decorated with gems or without any decoration are presented. Colorful dials are supplied with three hands, aperture of days of a week at the position of “3 o'clock”, and date aperture at the position of “9 o'clock” in model Gotham auto chrono. Collection Moments, Second chance includes examples of wonderful watch supplied with two separate dials, each of which is supplied with three hands and date aperture at the position of “3 o'clock” and “9 o'clock”. Their dials are completely covered with diamonds, which gives an outstanding look to each model. Genuine leather straps of different colors decorate watches and steel bracelets are decorated with gems. Debonair collection watches are also marvelous. They have squared cases, dials are of different colors or have different abstract pictures which sometimes remind flowers or hour-marks 12, 3, 6 and 9. In the upper left corner there is Tiret logo and date aperture at the position of “3 o'clock”. Created by Lazar watches in Automatic chrono series can be attrobutes of a man and a woman – both. Round cases are made of steel and decorated with enamel mountings of different colors. Dials are designed in different colors as well, they are supplied with three hands and chronograph counters at he position of “12 o'clock”, “6 o'clock” and “9 o'clock” so well thee is also an aperture of date and month at the position of “3 o'clock”. Watches of Automatic chrono collection are supplied with Swiss movement ÅÒÀ 7750 and automatic rewind and 48 hours power reserve. Automatic chrono collection watches are decorated with real leather straps of different colors. Incomparable watches presented in Tourbillon collection gives a kind of glistering show of gems, placed in bezel and dials shining. At the position of “6 o'clock” there is a tourbillon, which gives marvelous image to Tiret watch. A special interest causes watches presented in Exclusive Design series. The dials are separated into two parts at the left part there are hour, minutes and seconds indicators, at the right part there are images of celebrities made by gems. The apertures of date are placed near the hour mark “4”. Other models have images of celebrities in the central part of their dials. Exclusive Design collection there are also other luxury models supplied with tourbillons, made of 18carat red gold. Some of such wonderful watches were produced in collaboration with famous designers. Posh watches produced by New York Company Tiret can become irreplaceable thing, which can reveal a sophisticated taste of their owner.